A fast-moving cloud passed in front of the moon. 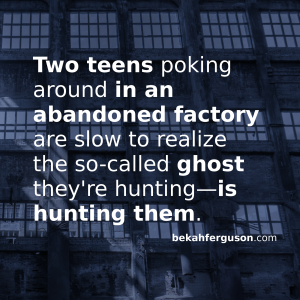 Garrin crept forward through wet brush, lying low as he made his way toward the looming factory building where two fifteen year old boys, using smartphones as flashlights, had just disappeared through an entrance door hanging off its hinges. Their crunching footfalls soon faded, swallowed up by the stridulation of crickets. Before entering the same door, Garrin looked over his shoulder first, and peered in through a broken window pane next to the door. The corridor beyond was empty, save for bits and pieces of debris, so he went inside, careful not to kick or scuff any litter, or to step on any loose tile. Though his steps could be loud as thunder if so chosen, tonight they were light as snow. Many doors flanked the left side of the hall, but muddy footprints made a straight path to the farthest one. Garrin closed the gap with swift strides and stood with his back against the wall next to the door. In the room beyond, the boys conversed in undertones, laughing at times. He guessed them to be about a hundred feet away. Before entering, he looked through the door window and scanned the area. It was a large room, the ceiling some three floors above, and two parallel rows of windows on the far wall overlooked a forest crowding up against it; industrious branches growing through the fragmented panes here and there. Silver beams shone through the windows along the left side of the room, suffusing the contours of ancient equipment and myriad trash, along with tables and conveyor belts whose surfaces had collected dirt, dead insects, and chunks of machinery for many years. Moss and rain water filled the cracks in the slanted cement floors; peeling paint hung in strips from the walls. Garrin ducked down and entered the room without a sound. The air was dank; bitter with the scent of soil and vegetation. Residual rain water dripped from a window ledge nearby onto a pipeline. Little by little he inched his way closer to the boys, who were in a far corner poking at things and rooting through refuse. When he reached a close proximity, he remained hunched and still beside an overturned table, listening to their conversation. Garrin peered out from the shadows, getting a clearer visual of the teens. Handing back the phone, Landon stood up from the stair and moved next to his friend. Together they peered up the barely discernible staircase as Hunter once again used his phone as a flashlight. The beam enabled them to see only a short distance ahead, but the metal stairs looked sturdy and intact enough; at least from this vantage point. “What’s up there?” Landon asked. Hunter let out a loud laugh but said nothing more. Landon rubbed the back of his neck in a self-conscious manner, as though embarrassed by the implication. Garrin scanned the upper floor where several derelict offices stood hidden in the pitch beyond a palely suffused ramp some thirty feet above ground level. Hunter began mounting the stairs, while Landon switched on his own flashlight app and followed suit with steps much more tentative than his friend’s. 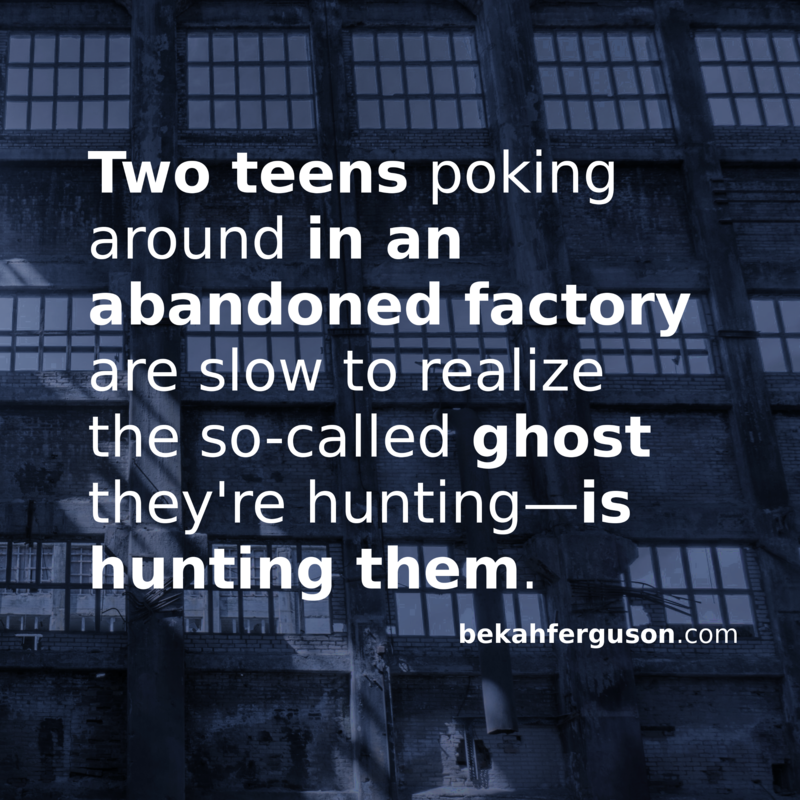 This end of the factory was so shrouded, the boys looked like floating flashlight beams moving upward. With a sudden instinct, Garrin glanced back toward the distant entry door where moonlit contours were much more visible. A murky figure moved along the wall toward him like a mist and vanished behind some machinery. Seconds later it reappeared, moving right past Garrin, who remained crouched and hidden, before it disappeared into the pitch beneath the raised offices. Taking a risk, Garrin dashed from his hiding place to the stairs and took them two at a time without a single sound, until he was only ten feet behind the boys who were now halfway across the ramp. Here decades of rain water had severely rusted the metal and the boys were taking careful steps around compromised grating while holding onto the ramp railing for support. The flashlight beams were too weak to reach the office in question, which was still some fifty feet ahead, and they paused at each grimy window and door to determine where they were. From here one could see full across the factory to the other side where the moon was perched high in the sky beyond the rows of windows, going in and out of focus as clouds passed by. Without warning, the wings of a startled pigeon fluttered past Garrin’s face as it took off for another perch high in the rafters. At the sound of flapping, both boys whipped around just as Garrin sidestepped their flashlight beams. Their faces illuminated by the phones, Landon’s eyes were wide with evident fright while Hunter’s sparked first with excitement, then annoyance. “Just a bird,” he said with an exhale. “Come on.” They turned around and resumed their course. A drawn-out creak sounded in the distance, as though a door had opened. Garrin took advantage of their hesitation and visually examined the integrity of the flooring up ahead while also scanning for the murky figure who had vanished on the lower floor. The thing could be anywhere by now, possibly waiting for them in the far office. And what was it doing here anyway? Instinct told him he had to find out fast. The smell of mildew and bird droppings was especially strong up here; the metal office fronts copper and bronze wherever the blue paint had peeled away. There were no sounds but the occasional coo of a pigeon, the pluck pluck of dripping water, and the murmur of crickets outside. Hunter raised his flashlight beam high, trying to see farther ahead. The nearest door was closed, and the boys moved forward with wary steps and shallow breathing. Garrin remained as close behind them as possible without detection. They passed this office and soon reached the next; its door closed as well. The final office came into view as Hunter’s breath caught in his throat with a rasp. The door was indeed wide open. He fumbled with his phone, switching to the camera app while Landon’s flashlight beam, positioned on the door, wavered just a fraction. If only Garrin could get in front of them somehow without being spotted. He had to delay them. Garrin examined the rubble beside him and snatched up a crushed soda can. Without even the sound of air moving beneath his arm, he flung the can far out over the railing. It clunked and ricocheted off several protrusions before scraping across the ground and settling into silence. Hunter let out an expletive and Landon jerked up his phone in a futile attempt to see what had made the noise down below. As they leaned over the railing, Garrin moved behind and around them with no more noise than a leaf sailing on the wind; and entered the office. Though the room was black as tar, an even darker shadow stood behind the desk.